Ambient Art DVD turns your TV into an Impressionist Art Gallery! 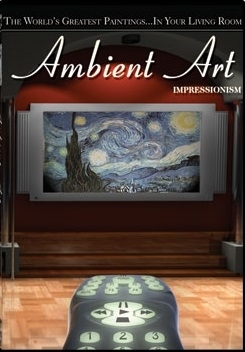 This DVD is a collection of 346 paintings from 11 Impressionist Masters (from Van Gogh to Renoir) to create a virtual anthology of one of the world's most popular art movements. Pop it into your DVD player and enjoy a window into your own private art gallery--stocked with the world's most famous Impressionist paintings. > No software required. Works on any DVD player. Impressionism features 346 paintings hand-picked by art historians for their beauty and historical relevancy. Optimized for both standard and widescreen TVs.